Awarded the Dag Hammarskjöld Medal. 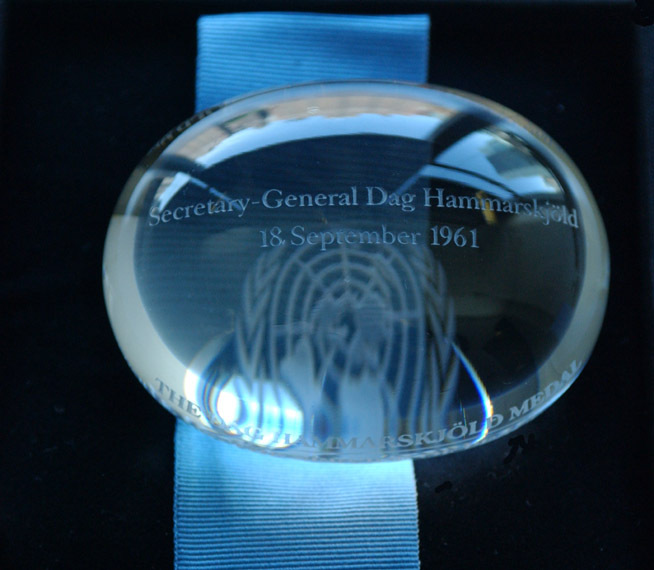 The U.N. Secretary-General established the Dag Hammarskjöld medal for posthumous award to members of peacekeeping operations who lost their lives during service with a peacekeeping operation under the operational control and authority of the United Nations. 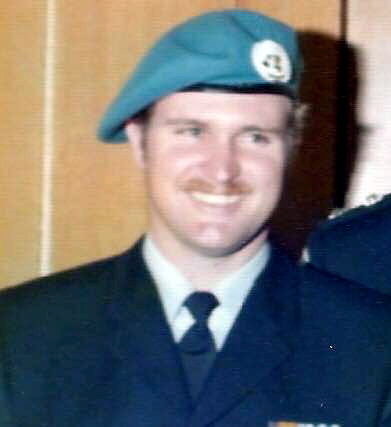 On 12 November, 1974 Constable Ward was serving with the Eleventh Australian Police Element in Cyprus. Whilst travelling in a Land Rover near Lefka the vehicle hit a landmine in the buffer zone. As a result Constable Ward was killed and Constable 1st Class John Woolcott was seriously injured. 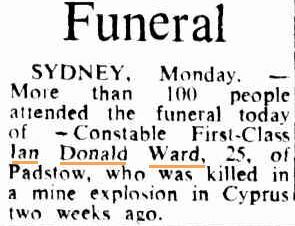 Constable Ward is the 3rd and last Australian to die in Cyprus. 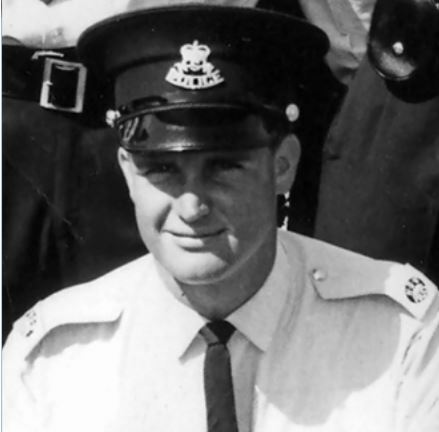 The constable was born in 1949 and joined the New South Wales Police Force on 12 April, 1968. At the time of his death he was stationed in Cyprus and an Acting Sergeant. John Woolcott recovered from his injuries and ” Wooly ” later retired from NSW Police Force either as an Sergeant at Manly Police Station or an Inspector at North Sydney / Mosman. This, is yet, to be confirmed. ( 10 August 2017 ). 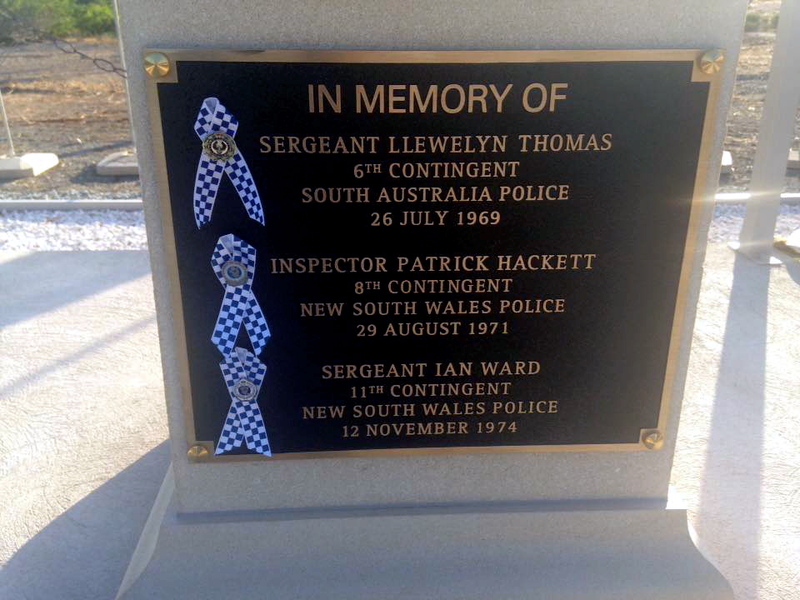 Ian’s memorial at the Goulburn Police Academy. 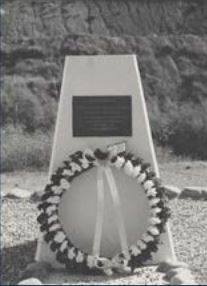 2003 Police Remembrance Day is marked with a ceremony at the cairn erected in memory of Sergeant Ian Ward. The closure of Nicosia Airport meant a circuitous route to Cyprus for the second half of the eleventh contingent led by Merv Beck. the Brize Norton RAF Base near Oxford and thence via Malta to Cyprus. RAF flights were ‘dry’ and the seats faced the rear, so the Australians appreciated the traditional welcome at Limassol Headquarters. The newcomers ‘pumped’ the old hands for news of the war while they themselves were pressed for information about events in Australia. The new arrivals were soon split up. Ray Leister was assigned Control Room duties while others went to Ktima and Polis. After only five days on the Island the unthinkable happened near a road-block approaching Lefka. Ian Ward, a replacement from New South Wales, was killed and John Woolcott injured when their Land Rover detonated a land-mine in an unmarked field. The Australians were conveying a Turkish Cypriot family from Ayios Nicolaos to the Turkish Cypriot controlled area at Lefka and one of the four passengers was killed and the other three seriously injured. The fatality cast a pall over the contingent. 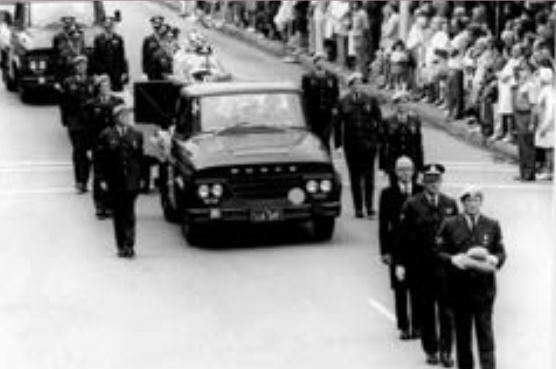 A number of moving ceremonies were held before his body was flown home to Australia. Twelve months later a cairn was erected to commemorate the tragedy and each twelve months a short service is held near the memorial. Geoff Baker was a member of the Board of Inquiry convened under British military regulations to investigate the incident. Land-mines were the major component of fortifications along the confrontation zone. UNFICYP had lodged a number of protests about mine-laying procedures and the fact that many fields were neither marked nor adequately recorded. 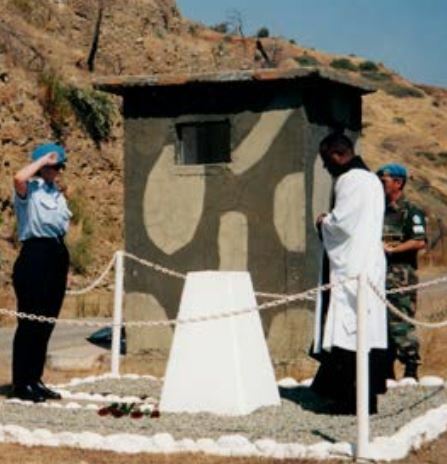 UNFICYP began a special programme to remedy the deficiencies, but two UNFICYP soldiers were killed in similar circumstances during the following twelve months. LONDON, Tuesday (AAP). 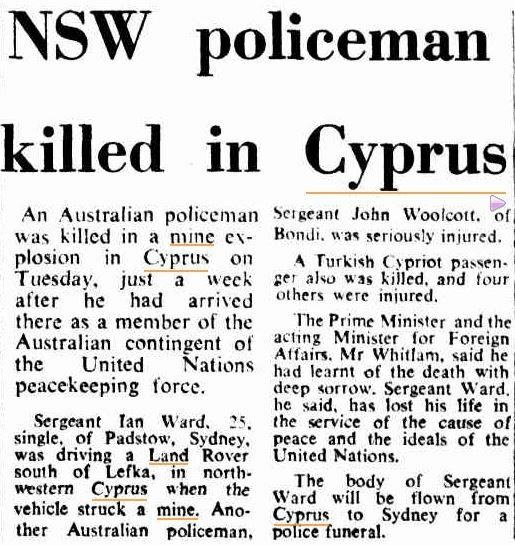 – Representatives of all United Nations peace keeping forces in Cyprus will take part in a memorial service today for Sergeant Ian Ward, 25, a Commonwealth policeman of Sydney, who was killed in landmine explosion last week. His body will later be flown to Sydney for burial. 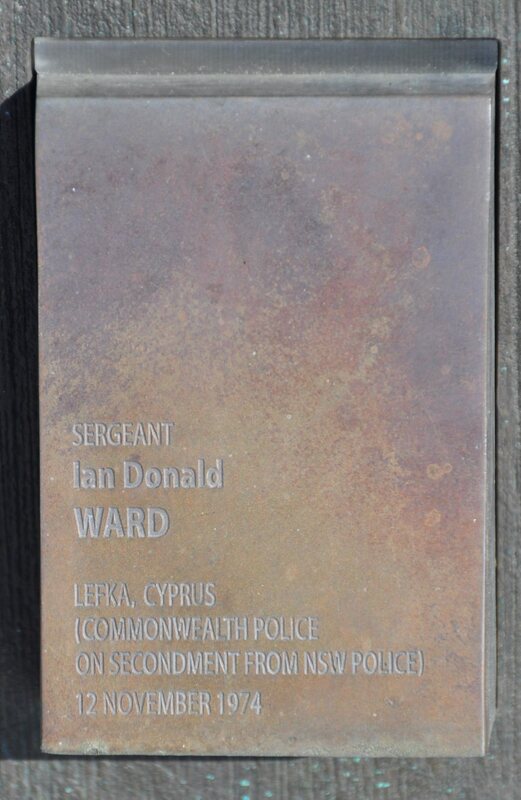 Located within the Honour Precinct is an original ornate marble tablet featuring early losses of New South Wales Police Officers. The tablet is flanked by the New South Wales state flag and the New South Wales Police Force flag. 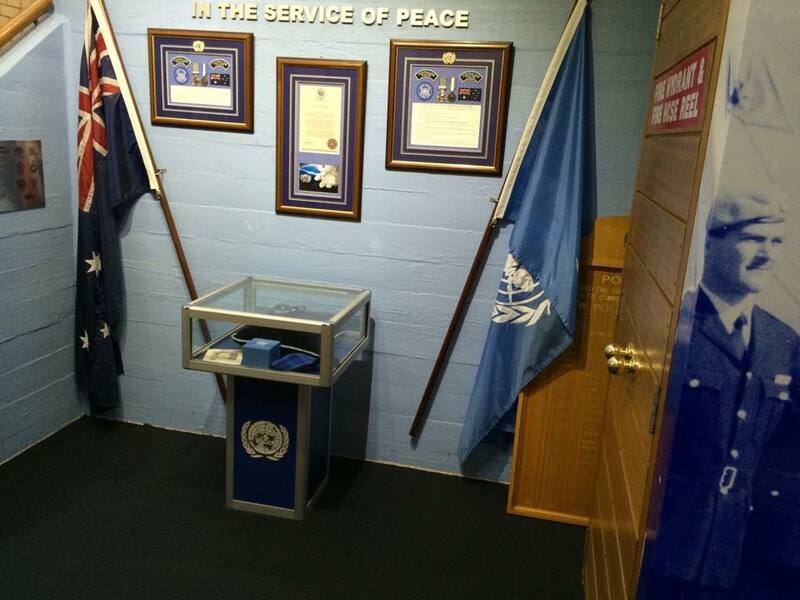 The Peacekeeping Display honours all members of the NSW Police Force who have served in peacekeeping operations throughout the world and houses the Dag Hammerskjold medal belonging to the late SGT Ian Donald Ward who died in UNFICYP. This was donated to the NSW Police College on the 29th May, 2010 from Mr Ken Ward, OAM, father of SGT Ward. On the 12th November, 1974, a member of this Force, Constable 1st Class I. D. Ward, who had arrived in Cyprus a few days before, and Constable 1st Class J. Woolcott, also of this Force, were carrying out humanitarian work transporting refugees. 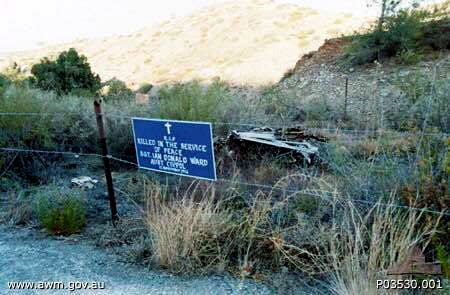 The United Nation’s land rover in which they were travelling struck a land mine on a road between Limassol and Lefka resulting in the death of Constable 1st Class Ward and severe injuries to Constable 1st Class Woolcott, Constable 1st Class Ward was posthumously awarded the United Nations Medal, Cyprus Division. Mr Denis Percy – National President – UNPAA. received serious facial and other injuries. race, religion and language, is a martyr of duty. HANDOVER AND BLESSING OF THE DAG HAMMARSKJOLD MEDAL. a lonely village road and a world away from Cyprus, we remembered our Police colleague. forget those who die in the line of duty, either in Australia or whilst serving overseas. 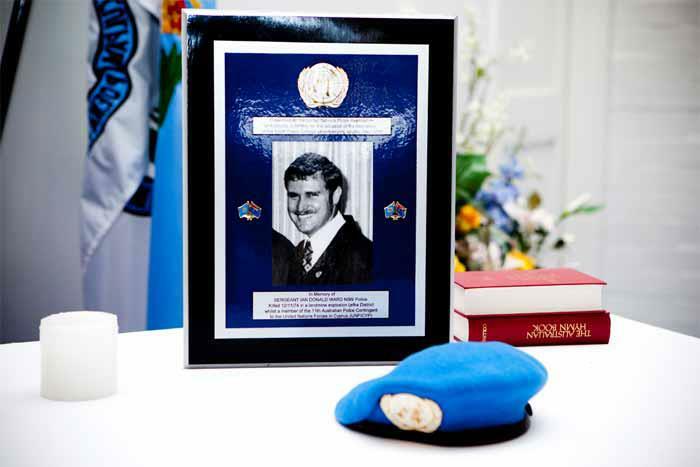 Ian died as a Federal Police Officer on attachment from the NSW Police for his UN Service. and former Scandinavian leader of the United Nations at its headquarters in New York. Solomon Islands and other multinational peacekeeping operations. and a combined New South Wales Police Force and Australian Federal Police flag party. Police Force who have died in the service of their state and their country. NSW Police Force Sub Branch of the RSL. NSWPF Sergeant Dave McCann, OAM reading the Beatitudes. Superintendent Gregory Moore, APM the Principal of the NSW Police College. two guardians of the medal. have to their departed colleague and fellow peacekeeper. contributed to United Nations Peacekeeping Operations as United Nations Police Officers. As such it fits well within the ‘Honour Precinct’ of the NSW Police College. contribution of Australia’s servicemen and women in war, conflicts and peace operations. capacity of local authorities to act against a humanitarian backdrop.” Said Snr Sgt Elm. “This day has been on the cards since I arrived at the College in February of 2007. Stephens and dedicated by Reverend Peter Robinson at the ceremony. Branch, the Police Federation of Australia; and the Police Credit Union. and the Professional Standards Unit of the Office of the Principal, NSW Police College.